Alexandra Kurland is a graduate of Cornell University where she specialized in animal behavior. She began teaching in the early 1980’s. Her area of particular interest is the development of a horse’s balance: physical and emotional. Helping horses stay sound throughout a long lifetime is the goal. The result is beautiful horses that feel like heaven to ride. 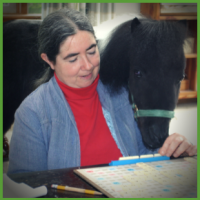 In 1998 Alexandra launched the rapidly growing field of clicker training for horses with the publication of her first book, Clicker Training for Your Horse. 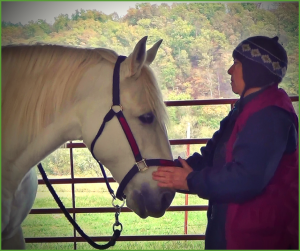 Alexandra teaches clicker training geared to any horse need or sport—including developing a gentle and companionable riding horse, halter training foals, training advanced performance horses, and reforming difficult and unmanageable horses. Alexandra travels widely, giving clicker training seminars and presenting at conferences in the US, Canada, the UK, and Europe. She has written The Click That Teaches: A Step–By–Step Guide in Pictures and The Click That Teaches: Riding with the Clicker. She has also produced The Click That Teaches DVD lesson series, an on-line training course, and she is presently at work on new books and videos. thank you for introducing me to alexandra kurland – i love her ideas! Who knew there are butterfly bullies!